Not sure what to purchase for the trapper in your life? Give a Night Owl Lures Gift Certificate! 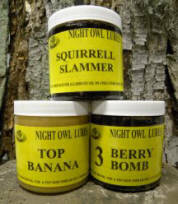 All gift certificates will include a copy of our newest Night Owl Lures catalog. If recipient's address is left blank, the certificate will be sent to your mailing address. Gift certificates can be redeemed over the phone, through mail order or at a convention we attend.